Mass flow computer for measurement with differential pressure devices based on ISO 5167 specifications, such as orifice plates, nozzles and venturi tubes. - Includes more than 100 fluids. - Alarms and output relays. 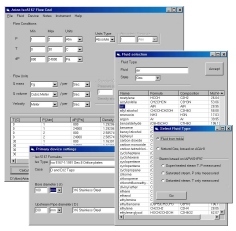 Arian Flow CAD V1.0 software and technical note. Arian Flow CAD V2.0 software. Flow totalizer for analog process variable input. Used with analog output flow meters (e.g. magnetic). - Alarms and 2 output relays. Flow totalizer for pulse inputs. Used with positive displacement flow sensors ( eg. paddle wheel, turbines ). Lower 4 digits shows flow rate while 6 higher digits presents the totalized flow.